Much ado has been made about the University of Nebraska at Omaha’s brand-new, $82.8 million facility. Baxter Arena has so far impressed through Omaha hockey’s opening weekend, and looks to stand as a UNO landmark for years to come. While the interior of Baxter is everything a university could hope for in an arena – comfortable seat-ing, bright lights, top class facilities – the exterior leaves much to be desired. For something into which so much planning has gone, and so much money…why such an uninspiring exterior? Visible from the interstate, one could safely assume that UNO would exhaust all avenues in creating the most visually appealing, memorable building they could. They hired Omaha-based HDR, Inc. one of the United States’ leading architectural engineering firms to design – by all rights a very in-formed hire – yet HDR, as they are wont to do, provided a technically sound, bland building. The exterior, with white, gray and grayer standing out as prominent colors, leaves much to be desired. Unassuming, slab-like walls sup-port the white dome, which houses the central playing surface. Roughly attached to the side is the community rink, a “screened-in porch addition”-like structure that harshly contrasts the curvilinear roofline and outfacing features of the main building. The design of Baxter is eerily reminiscent of another Omaha-area, HDR driven project – that of Baxter’s cross-the-street neighbor, Aksarben Village. Aksarben, much like Baxter, features many techni-cally sound, unimpressive build-ings. Relying heavily on glasswork and concrete to create a modernistic feel, Aksarben fails in its emotional appeal to its visitors – as does Baxter. exterior, the arena does not intro-duce to the viewer any focal point on which to grasp. It is too clinical, and lacks character. Dissimilar from Aksarben, the glasswork at Baxter is one of few intriguing features.Though overall the community rink area (the part of the building utilizing the most exterior glass)appears rushed and as an after–thought, if taken separately from the building proper it appears appropriately modern and unique. The “glass box” idea creates a floating roofline, and an interesting playing interior. The glass box in and of itself stands as an identifying feature of Baxter and sticks in the memory of visitors. This glass box seems wasted, though, when placed in conjunction with the main building. As written before, the harsh lines of the cubic structure contrast too greatly with those of the curved central arena. It is small inconsistencies like this that lead to an overall iffy design, one that seems impressive on a micro scale, but when taken to the macro combat each other and drag down the overall aesthetic. CenturyLink succeeds everywhere Baxter fails. CenturyLink’s curved roof offset by a flying compo-nent has slowly become iconic in Omaha’s interstate landscape. The glass-enclosed front is tasteful, and not overdone. Baxter, meanwhile attempts both the curved roof and glass-laden visual, however it does not come off in quite the same way as its predecessor. The branding of the building also leaves a bit to be desired. 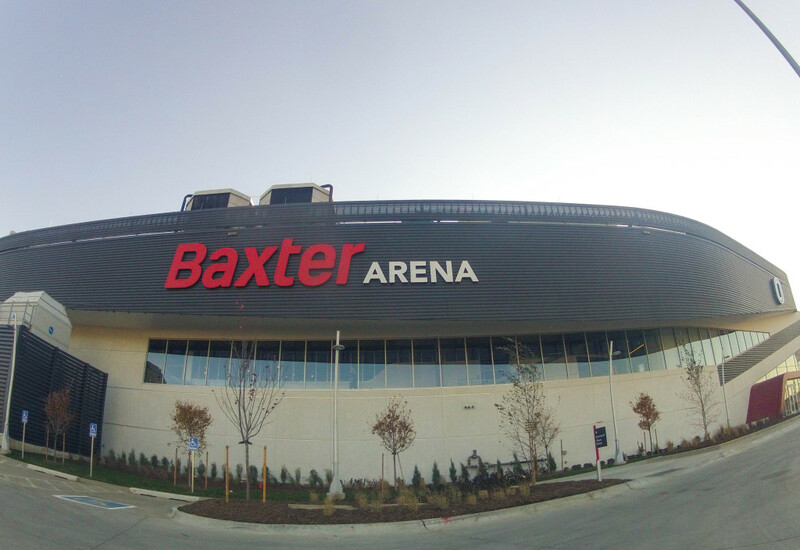 Though the “O” and “Baxter Arena” can be found on the outside of the arena, they do not leave the visitor with the “Omaha” brand in mind. Baxter’s logo itself is uninspired, a simple red and white logo, for some reason it does not include Omaha’s primary color of black and instead utilized the secondary colors. The “O” is large and impressive, but no-where can one find any more UNO branding on the exterior. This seems to be a missed opportunity to emphatically position Baxter as the new center for UNO sports, music and the campus as a whole. In general, Baxter’s arrival has been nothing but good for UNO. I have endless praise for Athletic Director Trev Alberts and Chancellor John Christensen and their tireless efforts to bring Omaha a home for their athletics, but I feel as if the building could have been more of just that – a home. As of now, the clinical finish feels architecturally and emotionally devoid. For a place where athletes and students should feel a sense of overwhelming school-pride, Baxter Arena stands as a monument to what could have been something wonderful.